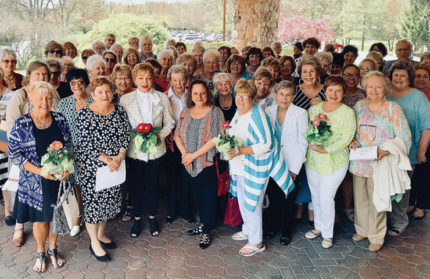 Celebrating its 125th year of service with a bang, the Women’s Auxiliary of Chester County Hospital raised an impressive $1.25 million for a two-year pledge to mark this landmark in their organization’s history. 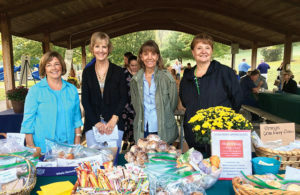 Over the years this dedicated community of women has raised awareness and funds to improve Chester County Hospital. Helping departments from neonatal to emergency, their energetic and generous efforts set a standard for volunteers. Although this Women’s Auxiliary is the oldest such organization in Chester County, that’s not its only distinction. Founded in the summer of 1893, just a year after the Hospital was built and when similar organizations were typically formed by doctors’ wives, the Women’s Auxiliary was created by diverse women in the community who were determined to make a change and decided to do just that—regardless of who their husbands were or if they even had husbands. These resourceful and dedicated women saw Chester County Hospital’s need for supplies, like fresh linens and even chickens to feed the patients. The group began to host spelling bees and donation days to raise funds, setting the foundation for the steadfast and lively women who now run the organization over a century later. Founded on these philanthropic and progressive ideals, it’s no surprise the organization has grown today to over 400 members in 10 branches. Working out of the Chester County Foundation office, they continue to help support the Hospital and the community. Current Auxiliary President, Marie Robinson, credits the organization’s community-based values as a key reason they’re continuing to thrive after 125 years. Robinson says, “It’s so inspiring to see women who are willing to give up their time for such a charitable cause.” She says it also helps that the Hospital continuously shows its appreciation for the organization. When you’ve been raising funds for 125 years, you’ve got to get creative about how you go about it. While you might not see chicken donations or spelling bees these days, you will see plenty of glamorous events that make donating to charity both altruistic and fun. If you’re interested in educating your palate at a wine festival, the Brandywine and Greystone Auxiliaries sponsor one at the Dilworthtown Inn that benefits the Abramson Cancer Center and Neighborhood Health Hospice. This year was their 27th year to “Uncork the Cure to Cancer.” They had over 100 wines to try as well as craft beers, live entertainment and plenty of food trucks. Want to check out the sport of kings at one of the local polo tournaments you’ve heard so much about? 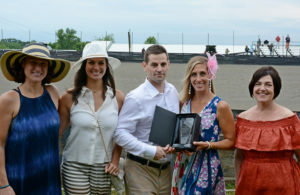 The Turks Head Auxiliary sponsors the Polo Cup in June that benefits the Hospital’s prenatal clinic. Be sure to wear a hat and prepare an elegant tailgate to fully enjoy the event! Or try your luck at a golf invitational. The Willistown Auxiliary sponsors the Fore Health Golf Invitational benefitting the Health Services for Women and Children. Other branches organize fashion show luncheons, pocketbook bingo, raffle sales, crab cake sales and other wide-ranging, creative events. But these lively events aren’t the only fundraising the organization does. The Kennett Square Auxiliary operates the highly successful Encore Shop, an upscale consignment shop near Longwood Gardens that’s filled with everything from antiques to apparel so you can shop for a good cause. The shop is a major source of on-going funds during the year. These fundraising activities have enabled the Auxiliary to provide the Hospital with an improved cardiology lab, mammography machine, monitoring systems for the emergency department, new mother and baby pavilion, and many other valuable services. Among the assortment of engaging events, the Auxiliary’s most popular fundraiser is Chester County Day, a day when beautiful and tastefully furnished houses and historic landmarks throughout the County open their doors to the public. In the early years, Auxiliary members served tea to the tour-goers from silver tea services. Although the idea for this fundraiser came from a similar event held in Nantucket, it’s been an ongoing tradition for the Auxiliary—aside from a brief hiatus during World War II. Celebrating its 78th year in 2018, this fundraiser has raised around $5 million for the Hospital since 1936. Robinson recalls receiving a call from Australia because the caller was interested in attending. The popularity of this event has indeed spread worldwide! Interested in helping to support a key community resource, Chester County Hospital? Reach out to volunteer or just attend one of the fabulous events. Attend a fashion show and support a good cause. Tour exquisite houses and help support the Hospital. Drink wine at a festival and know you’re making a difference. And be sure to keep an eye out for their Remembering Our Angels project this holiday season. To volunteer or for further information, contact the Women’s Auxiliary Office at 610-431-5054.